TODAY′S MARKETPLACE requires that businesses maintain excellent relationships with their customer base while offering a greater range of options often combining services with traditional product offerings. While many organizations enthusiastically attempt to undergo transformations to accomplish this and other major changes, they are often frustrated with the results. Executing Your Business Transformation provides valuable guidance for companies contemplating mergers, acquisitions, or major restructurings of their business models. This important resource is based on the expert authors′ decades of experience dealing with major business transformations and offers an illustrative set of lessons gained from the authors′ wide range of experiences. Some of the unorthodox and yet highly valuable lessons in the book include Your customers are always right, except when they aren′t; What got you here may kill you there; There is no strategy if nobody knows what to do; Consultants are not an excuse for not knowing your business; Yesterday′s leadership skills may prevent tomorrow′s success; and Transforming strategy requires more than expensive software. 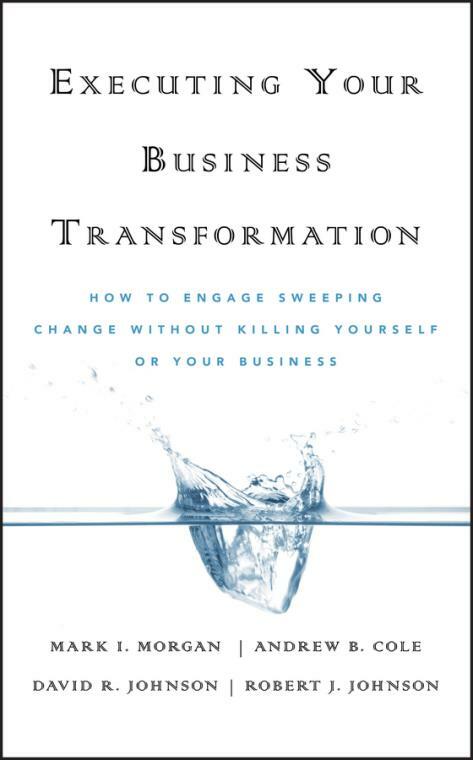 With keen insight and rare candor, Executing Your Business Transformation provides thoughtful advice to any leader who understands that the strengths of today′s company will not translate into the results of tomorrow. 1 Once Upon a Time In Transformation. Profiles of selected companies in transformation. 2 What Got You Here May Kill You There. Letting go of legacy success in order to prosper in the future. 3 Yesterday′s Leadership Skills May Prevent Tomorrow′s Success. 4 There Is No Strategy If Nobody Knows What to Do. Translating strategy into action moving forward. 5 Transforming Strategy Requires More Than Expensive Software. How to keep from being a fool with a tool. 6 Transform Human Resources into a Strategic Advantage. How to engage HR at a strategic level. 7 Your Customers Are Always Right, Except When They Aren′t. Doing what is right for customers even when it is not what they asked for. 8 Don′t Let Analysts Run Your Business. Pleasing the street is not always what it′s cracked up to be. 9 Merger Is Not a Four–Letter Word. How to reduce the risk of value loss in merging companies. 10 Who Melted My Cheese? 11 Spin Is Overrated for Creating Value. Replacing rhetoric with real communication. 12 Consultants Are Not an Excuse for Not Knowing Your Business. How to engage professional services for maximum return. Next steps in creating better models and methods to transform organizations.